Just another day in America that sadly felt all too familiar, unfortunately. In the case of the departed singer-songwriter, it turned out to be a premature announcement of the departure of Tom Petty, who passed away many hours after his death was initially announced in the major media outlets. The death of Tom Petty caught so many of us completely off-guard. He seemed to be at the top of his game, playing better than ever with his band of Heartbreakers, having just finished an extremely successful 40th anniversary tour. Meanwhile, yours truly was 400 miles away from his homebase, dealing with an unexpected broken tooth accident while helping a friend deal with the aftermath of a major move. As it’s taken me a few days to assemble this blog post, here’s a few things I thought needed to be shared about Tom Petty…. 1) When Tom Petty was an 11 years old boy, he saw Elvis Presley (who he didn’t know much about) on a movie set in Florida for the feature film “Follow That Dream.” As he witnessed how people reacted to this special visit by Elvis, Petty’s life was forever changed by the experience. “He stepped out, radiant as an angel. He seemed to glow and walk above the ground. It was like nothing I’d ever seen in my life,” Petty said of Presley in the book “Conversations With Tom Petty,” written by Paul Zollo. Always a fierce advocate for artistic independence and putting his fans first, Petty fought many battles with his record labels. In 1981, Petty took on MCA Records over the list price for the album “Hard Promises” — MCA wanted to issue it for $9.98, while Petty insisted that it sell for $8.98. Petty won. It wasn’t the first time he’d gone to war with MCA. In 1979, when the band’s label, Shelter, was bought by MCA, Petty soon got into a dispute with the new owner over songwriting rights. Litigation ensued, putting Petty’s career on hold — and forcing him to file for bankruptcy protection. Petty settled with MCA in a deal that saw him and the band move to another MCA subsidiary, and the records soon resumed. 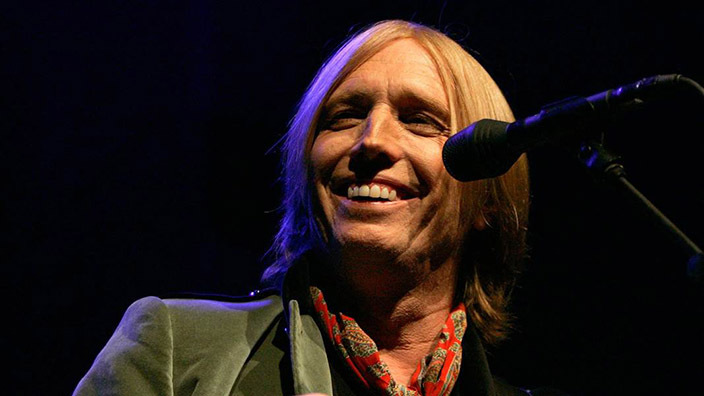 Petty, both solo and with the Heartbreakers, remained a fixture on the lists of the highest-grossing concert acts in the world for the next quarter-century. 3) Tom Petty & The Heartbreakers‘ 13th and final studio album, 2014’s Hypnotic Eye, debuted at No. 1 on the Billboard 200 album chart—the band’s first No. 1 debut—and was nominated for the Grammy for Best Rock Album. 4) Tom Petty was honored as the 2017 MusiCares Person of the Year for his charitable work. Six years earlier, he and his wife Dana were given the Midnight Mission Award in May 2011. Midnight Mission offers emergency help and drug and alcohol assistance programs for the homeless in the Los Angeles area. It was a live recording of a show he did in Ultrecht, Holland on December 4, 1982, released by some EEC record label called “On Stage” in 1993. 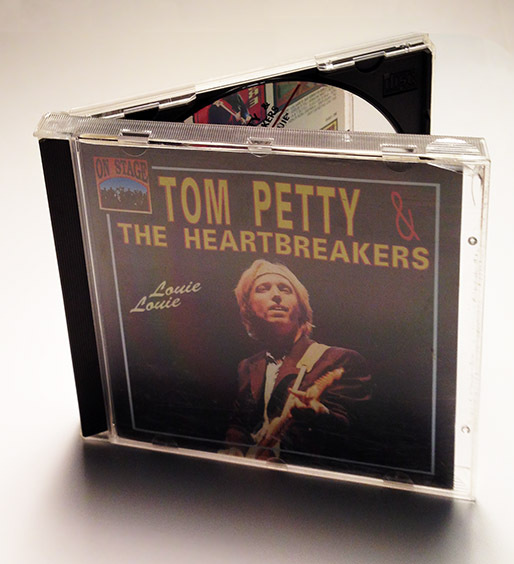 Tom and the Heartbreakers also performed the song live at The Fillmore in San Francisco on February 7, 1997. This entire concert is also on YouTube, but you’ll have to cue it to the 2:55:36 mark to hear LOUIE LOUIE. With the passing of Tom Petty, there’s been some wonderful tributes shared in cyberspace. 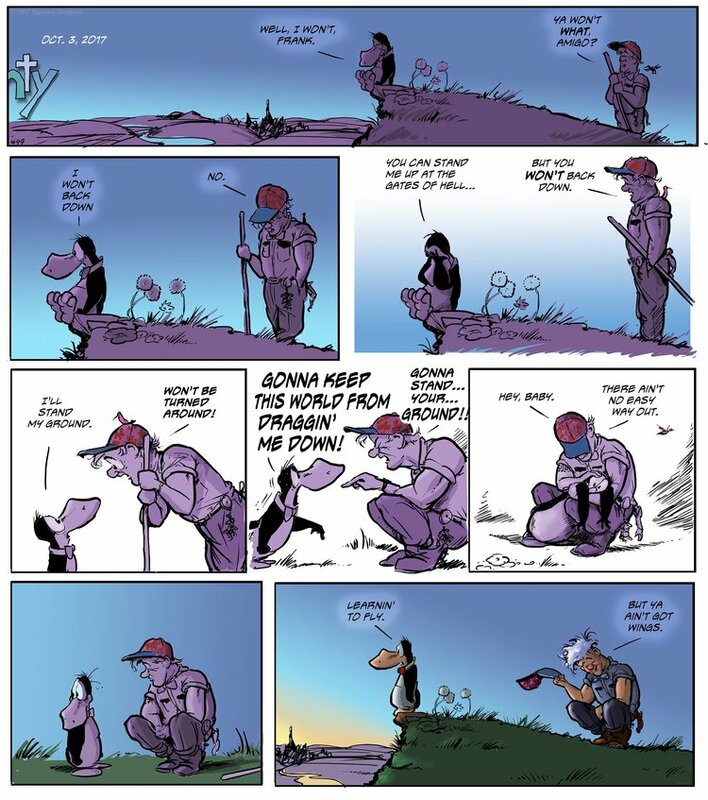 Here’s one of my favorites – Berke Breathed’s Bloom County 2017 Episode #499. I’ve been informed that in lieu of flowers, Tom’s wife Dana Petty has requested that donations be made to MusiCares OR Midnight Mission Los Angeles. Tom Petty and the Heartbreakers! … and don’t forget the Traveling Wilburys!